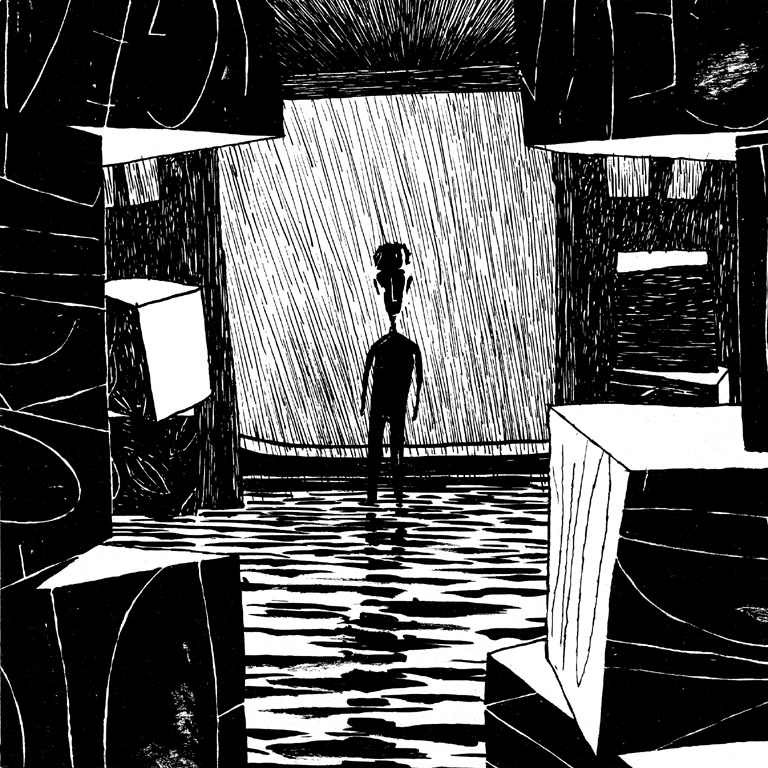 A wordless pean to water in all its fluid variants, and to the old warehouse district in the port city of Hamburg, Vortex is a story that celebrates – and is driven by – the drawn image. First published by Arrache Coeur in 1997, it is one of the quieter milestones in the development of graphic fiction; breaking wholly new ground in terms of the form that a story told in pictures can take. The book seems to be exempt from the usual tenets of narrative, and the story told is delightfully vague; there is no object to be acquired, no obvious goal to be pursued. Character development is not present in any meaningful way, and the story itself is somewhat mystifying to say the least. This is not to say that nothing takes place – the book abounds in incident, but specifics are never spelled out. Actions are embarked on, events take place; but their purpose and history is left unsaid for the most part. The murmuring water speaks my thoughts. There is a story of sorts, albeit one situated on the edge of the reader’s peripheral vision. A man in a canoe drifts through watery byways, and then proceeds to investigate the worn city he is floating through. The waters suddenly rise and flood, then just as quickly return to placidity. A second man appears, executing decisive actions of an unclear nature. Clouds gather; rain falls, then pours; a watery apocalypse seems imminent. The two protagonists meet, and an offering of sorts is made. The waters recede, and all is still once more. There is an important catch here, though: this cursory summation of the narrative belies its single most important aspect – the drawings. Done entirely in black and white, they are a sustained and astounding exploration of mark-making – clean, decisive lines; masterfully controlled hatching; liquid, shimmering pools of black; dry, scruffily textured patches; large, bold swathes of black and white; forms evoked through an absence of ink. Vortex is drawing unfettered, deployed without limits, teetering beautifully on the edge of abstraction and representation. It is an inspiring testament to the evocative power of the drawn image; an entire library on the potential of drawing with ink. In the midst of this virtuoso display of picture-making, the gentle and constant narrative thrust – evident throughout the book – builds to a crescendo; the various little meanderings of story come together, gathering momentum to become a torrent, leaving it to conclude in a literal storm of ink. Which begs the question: does one “read” (in the sense of following a narrative) the book, or simply look at it? The answer excludes neither option, which is why Vortex is a triumph for drawing and storytelling combined. Once begun, the reader’s passage through the book is as inexorable as with a piece of compelling music; listening, one is pulled into it, only becoming aware of having travelled when it is at an end. And as with music, questions of meaning and intent become secondary; the primary thing is the work, and the feeling it leaves you with.